Start creating websites that wow with Dreamweaver CS6! Powerful yet easy to master, Dreamweaver is the dominant professional web development tool. Web design expert Janine Warner has updated her bestselling Dreamweaver For Dummies guide for Dreamweaver CS6 and walks you through the essential steps to building the website you’ve always wanted. Both beginning and intermediate web developers will get the information they need from this easy-to-follow reference to Dreamweaver CS6. 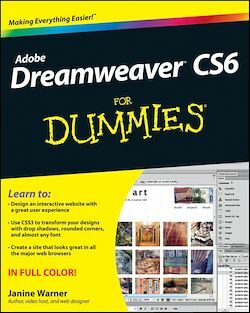 Web developers will find just what they need to channel their creative energy into effective, eye-catching websites with Dreamweaver CS6 For Dummies.